Senior citizens often find comfort in reading, as it can help eliminate boredom and anxiety. 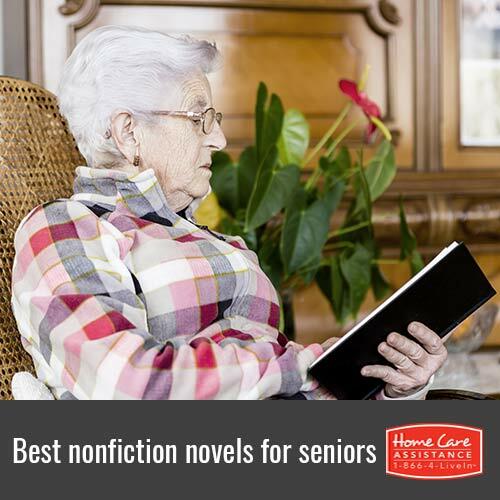 Nonfictionis a preferred genre amongst the elderly, and here are a few recent examples you may want to suggest to your senior loved one, brought to you by the staff at Home Care Assistance Harrisburg. The story of Mary McGrory might especially appeal to seniors interested in journalism and politics from the past five decades, and this book focuses on many important events and the woman who covered them. Older women also love reading books with female protagonists, as they can find more to relate to. This is the second book in a two-volume biography written by James Kaplan. It details the life of the late, great Frank Sinatra. This book is a great read for seniors because it can help them remember some of the people, places, and events from their past that coincide with the stories in this book while providing great entertainment from a familiar era. We Were Brothers focuses on two brothers growing up in a racist household, and how this impacts both of them later in life, both through broken relationships and eventual reconciliation. This memoir is a great read for seniors because it cancause them to reflect back to when they were younger and think about all of the sentimental relationships they may have shared throughout life, and how they were impacted by them. This nonfiction bestseller is full of adventure, love, humor, hope, and transformation. Seniors will appreciate reading about this powerful and intelligent woman who, despite being in her husband’s shadow, was still instrumental in making connections between Britain and America during WWII. Though reading can be a wonderful pastime for many seniors, others may have reduced cognitive abilities preventing them from such entertainment. Luckily,hourly caregivers in Harrisburg are available to help with mental stimulation. If your loved one could benefit from some brain-boosting activities, reach out to Home Care Assistance. All of our caregivers are trained in the Cognitive Therapeutics Method, which helps slow cognitive decline and delay the onset of dementia. For more information on the Cognitive Therapeutics Method or our other senior care services, call (717) 540-4663 to schedule a free in-home consultation.